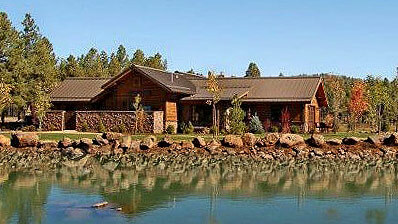 The Ranch’s generously appointed clubhouse consists of a comfortable great room with a large stone fireplace, exposed beams, and French doors leading to a covered patio overlooking the lake. This setting is ideal for entertaining your guests and the caterer’s kitchen makes preparations a breeze. The clubhouse also includes a fully equipped workout facility, large recreation space, men and women's restrooms, game room and business center. Access is strictly limited to Sierra Springs Ranch residents and their accompanied guests. 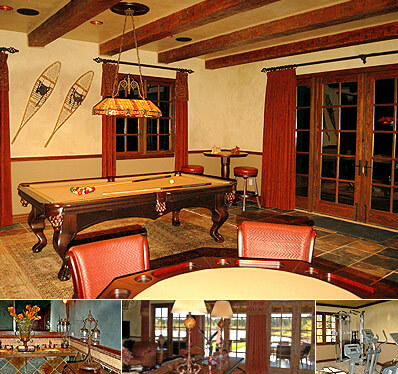 This clubhouse is another successful design by Jim Blochberger, an experienced and well-known architect, who has created plans for clubhouses and custom homes in some of the finest communities in the Southwest. The professional interior design left no detail untouched in this rustic posh place.